I have been asking myself why it is that people never want to take responsibility for their own actions especially when the consequences of their actions are negative. Why is it so much easier to find scapegoats and shift the blame on others what is called chipomerwa in Shona, my mother tongue than to face the truth and find ways of dealing with the problem? Why then is it that people expect problems to disappear yet they have not addressed the part of the problem to which they are the problem? These are questions I have been asking myself every time I think of the economic meltdown that Zimbabwe has undergone and the consequences that the meltdown has had on the lives of ordinary Zimbabweans, especially women and children. In their resilience, women channelled their energy to the informal market and a spring of misikas (vegetable market stalls) and flea markets ironically manned by women became a growing phenomenon as women tried to make ends meet. Some started going to neighboring states to bring any goods that could be sold and the phenomenon of cross-border trading became a house-name in Zimbabwe. But, it is also at that time that the black-market flourished as mainly young men engaged in shady deals madhiri. The field of gold panning chikorokoza and diamond dealing zvengoda made many people rich. But, these fields were the preserve of men as very few women were daring enough to engage in such cutthroat business. So yes, women in Zimbabwe bore the brunt of an economic era that was unregulated and chaotic. Zimbabwe’s involvement in the Coltan War in the Democratic Republic of Congo (DRC) between 1998 and 2003 significantly impacted the economy. The military initiative emptied the public coffers. Zimbabwe’s contribution was estimated at 11 000 in human resources and an unaccounted number of war-equipment. Most people viewed the war as unnecessary since the country was not under any strategic threat given Zimbabwe’s geographical positioning from the DRC. A report by the then Finance Minister of Finance Simba Makoni in his briefing to Parliament in August 2000 revealed that government expenditure directed towards the war was over USD $200 million. The reasons for that controversial intervention, the depth of losses incurred and the impact it had on the economy have never been fully accounted for and hence the real details remain mere speculation. It is also true that the widespread mismanagement of funds and excessive spending on luxury vehicles contributed in increasing government expenditure. This milked the government’s revenue and widened the debt deficit the country owed to international monetary institutions. 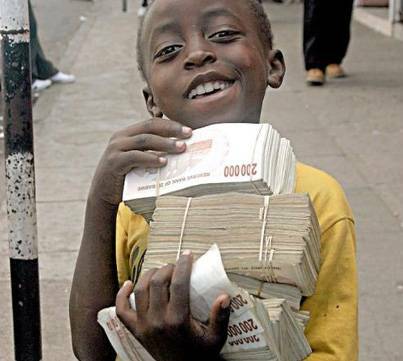 The response of the Reserve Bank, between December 2008 and 2010, to limited foreign currency flows into the formal market with constant devaluation of the Zimbabwean dollar and the printing of higher denomination value bank notes backed by nothing fuelled inflation and completely rubbished our currency. It also promoted speculative tendencies which drove trade in foreign currency to the black market where rates were more lucrative than the formal channels. This caused even greater reduction to the foreign currency flows in the formal market and the result was hyperinflation. The corruption that surrounds the mining of diamonds, platinum and other precious minerals has seen the country incurring losses with a few beneficiaries amassing wealth from the country’s resources. The politics of violence and intimidation that the country has experienced since 2000 has also led to its designation as an ‘unsafe tourist destination’ hence reducing the amount of revenue flowing into the coffers through tourism. Hence it cannot be disputed that the ZANU-PF led government played a major role in taking the Zimbabwean economy to the doldrums. The role that Western powers have played to the death of the Zimbabwean economy cannot be dismissed as insignificant. The sanctions imposed by the United States under the banner of the Zimbabwe Democracy and Economic Recovery Act of 2001 (ZIDERA) contributed to the economic woes. This Act significantly reduced Zimbabwe’s access to finance and credit facilities. With limited access to foreign currency, inability to apply for debt cancellations, coupled with the global financial crisis, Zimbabwe’s chances of surviving in such harsh conditions were next to nil. This catalysed fuel shortages witnessed acutely in 2008 which in turn catalysed price increases of all basic commodities and significantly made the cost of living higher. There is nothing wrong with citizens expecting state institutions to enforce the rule of law. Under normal circumstances it is the responsibility of the state to ensure that there is rule of law. However in the absence of effective state institutions and in the absence of sanctions then the resultant end is anarchy. But who is the anarchist? It is the citizens. It is you (who is reading this article) and I. When citizens obey the law because they fear sanctions and act against the same law when the sanction goes away or if there is no one to enforce it, I believe it is their fault if their actions have negative consequences on themselves. The response I will never get from all the different groups would be; “The Zimbabwean economy collapsed because we all contributed in some way to its demise.” The ‘we’ implies an assumption of responsibility and acknowledgement that everyone is part of the problem. It is not a mere shelving of responsibility on other parties’ shoulders and it is a reflection of honesty. Honesty that speaks of commendable levels of self-introspection and a wish to change the fate of this beautiful country I call home. Indeed the government, the Western powers, the politicians and we the people of Zimbabwe have all contributed to our economic woes and until we accept this reality and take concrete steps to solve the part of the problem in which we are the problem then Zimbabwe’s economy shall never rise out of this pit. Zimbabwe is currently rated as the country with the largest diamond deposits in the world. It has gold, copper, coal, platinum, silver and vast amounts of mineral deposits. It has wide expanses of land for agriculture. One of the Seven Wonders of the World, the Victoria Falls, is in Zimbabwe and the country could be bringing in revenue through tourism. Yet this same country ranked 172 out of 191 states on the Human Poverty Index in 2010, 159th on the Ease of Doing Business Index and is one of the lowest ranked countries on the General Inequality Index (GINI). People are starving surrounded by arable land and flowing rivers. Scores are unemployed and the government is broke!! This suffering that Zimbabweans are going through could have been avoided and can still be overcome. Accountability for a few hundred diamonds could change so many things. Strategic and well thought out redistribution of land could also make food available on people’s tables. Black empowerment strategies that are reasoned and conscientious of the global market paradigm in which we live would also ensure employment and production of good quality, affordable goods for Zimbabwean people. Initiatives that seek to empower grassroots economically targeting women who have proved to be the breadwinners and providers of families in trying times would ease the poverty. The politicians may jump in like bull frogs into hot water, dragging whole nations along and when a whole nation’s legs are burnt then they want to drag it in yet another wrong direction, but the ‘people’ do not have to let them continue doing so. The end to corruption starts with the individual, choosing to be a whistleblower. Choosing not to be corrupt is choosing a transparent nation and possibly a stable economy.